Also, I sympathize with the chicken owners' struggle against the stodgy homeowners' association types who want to prevent their neighbors from doing anything interesting. My local city council just refused a request to allow chickens kept in backyards. No one seems to mind cats running around - will even feed them! - and there's always loose dogs in every neighborhood. Squirrels, chipmunks and rabbits are all fine, as are snakes and occassional foxes. But chickens - the horror! I don't see why chickens are any worse for the quality of life in a neighborhood than dogs or cats. Dogs bark at anything that moves (especially people other than owners), bark until their owner lets them back in, and excrete their bodily waste on other people's lawns. Cats (if left outdoors) kill wildlife (sometimes at birdfeeders) and excrete their waste in other people's sandboxes and gardens. Compared to that chickens are pretty tame. I would object if my neighbors decided to keep a rooster. Occasionally I do like to sleep past the crack of dawn, and roosters don't have a snooze button. So I guess I have to sympathize with the stodgy homeowners association types on this one. Yeah, I'm a much bigger fan of hens than roosters. Hens lay eggs and don't make noise. Roosters could really be a problem. Roosters really aren't that loud. Yippy dogs are louder and make their irritating noises longer. 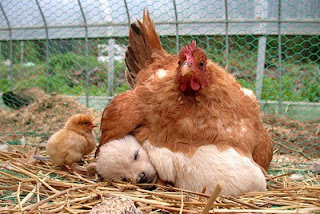 Why is there a puppy under that chicken? I think the puppy is enjoying hen-warmth, and the hen likes to provide her warmth to other creatures regardless of their species. Her chick, however, seems to find this arrangement suboptimal.